The technical description to the Add-On mygraficLCD includes technical and mechanical data and the layout diagram. Interface data, LCD configuration and display data are also into this document. 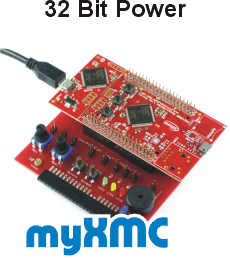 The myAVR ProgTool is a free software to program AVR microcontroller. With it, you be able to program and readout Fuse/Lock-bits, EEPROM and also the Flash of the controller. You can any copy this tool and can be published. The functions of this tool are extraction of myAVR products that is subject to license. Please note: The myAVR ProgTool uses the LibUSB driver 0.1.12.1. That's in need of some Atmel programmer, eg the AVR ISP MKII or the AVR Dragon. 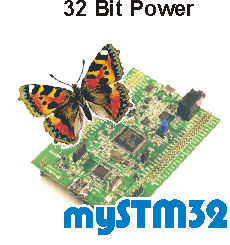 With that firmware version 2.5 the USB-programmer mySmartUSB MK2 command of an extended support for all relevant controller types of Atmel; controller did not produce any more are eliminate in the firmware. This version decreed of an RESCUE-Mode to rescue the Fuse-Bits of the controller. The RESCUE-Mode can activate with the mySmartUSB terminal (contained in: "tool_mysmartusb-terminal.zip"). With that firmware the USB-programmer mySmartUSB MK2 command of an extended support for older controller types of Atmel; exhibit a faster trasnmission rate for the programming and is able to select automatically slower transmission rates, if fusebits were put for example on slow clock sources Furthermore this firmware version has an extended TWI-functionality. For users of AVRDUDE 5.3 an extended configuration file is contained with the corresponding DEVICE codes. To use the extended abilities of the mySmartUSB firmware you will need special tools from myAVR. One of this is the mySmartUSB Terminal. It’s used for executing the steps to create a TWI or SPI protocol and to observe the succession of the actions and feedbacks. This version makes possible activating the RESCUE Mode of the mySmartUSB. In the TWI-textbook the mySmartUSB Terminal is used for analysis of the TWI protocols. mySmartUSB Terminal requires firmware version 2.5 or higher for mySmartUSB MK2. The driver provides a virtual COM port as an equipment in the system (see equipment managers). Auf der myAVR Stamp ist im Auslieferungszustand der Bootloader vorinstalliert. Die zip-Datei beinhaltet den Bootloader für die myAVR Stamp64 und die myAVR Stamp256 als elf-Datei. Mit dem Programm "myAVR ProgTool" kann die entsprechende Datei auf die myAVR Stamp über die ISP-Schnittstelle bei Bedarf erneut gebrannt werden. Dabei werden die Fusebits gleich korrekt gesetzt. Das Programm "myAVR ProgTool" steht zum Download zur Verfügung; DL112. This boot loader can be burned on the Atmega8 via the ISP interface. So the controller is also programmable for open operating systems via AVRdude over the myUSBtoUART interface. boofa.hex open with the myAVR ProgTool and burn it via ISP on the controller. The fast getting in (primer) describes you how you a microcontroller application make, in few steps translate, burn and test. These instructions are based on the software SiSy AVR. 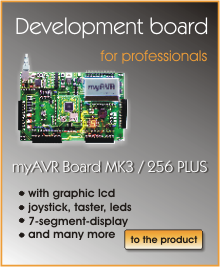 The description refers to the myAVR board MK2. Assemblers and C/C++ are used as a programming language. Note: The discriptions are only in german.